The long-awaited Premier League is now set to get underway on Sunday with Accra Hearts of Oak clashing with Liberty Professionals in a fierce local derby at the Accra Stadium. At Sekondi, Hasaacas welcome Power FC in another Zone B encounter while Feyenoord Academy host Heart of Lions at their adopted Cape Coast Siwdu Park.At the El-Wak Stadium in Accra, Real Sportive will open their premiership campaign with a game against Great Olympics. 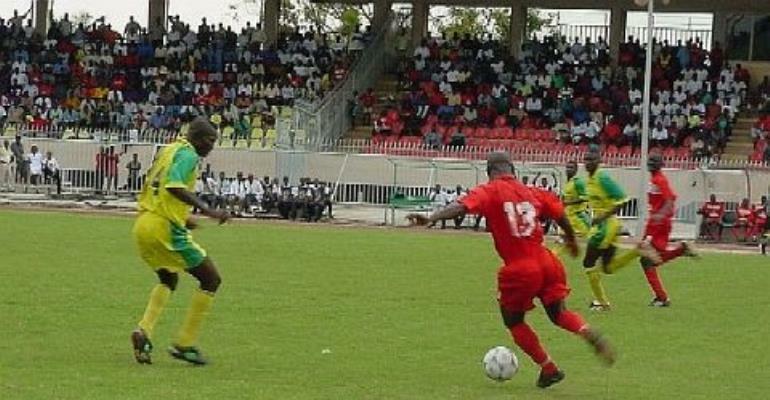 In Zone A, Kumasi Asante Kotoko will play host to B.A. United at the Kumasi Stadium, with RTU facing King Faisal at either Tamale or Bolga.Bofoakwa and Ashantigold will square off at the Sunyani Coronation Park while Arsenals encounter Okwawu United at Berekum. Hearts, Liberty To Set Accra Alight City rivals, Accra Hearts of Oak, and Liberty Professionals, are all set to rock the Accra Stadium again with a thrilling derby when the long-awaited Kinapharma Premiership finally hits the road on Sunday. Interest in this thriller can be derived from the manner the two combatants struggled to register some narrow wins over their Tunisian opponents in their respective continental assignments in the capital over the weekend. While Liberty struggled to a 3-2 triumph over Stade Tunisien in a Confederations Cup tie on Saturday, the Phobians could only manage a lone goal victory over Etoile Sahel in their Champions League encounter. Needless to relate, this Zone B top liner will be fiercely fought as usual as either side will aim at opening the competition on a bright note.However, with their confidence buoyed by the experience gained in Africa so far, Liberty will be out to avenge the various losses to their opponents last season which were repeated in the Coca-Cola Top 4. But as favourites, Hearts can be trusted to parry any such threat and visit their wrath on their young opponents ahead of their return continental assignments next weekend. In Kumasi, Asante Kotoko will return from their fruitless adventure in Algeria to open their title defence against Coach E.K. Afranie's B.A. United in a tight Zone A clash. Fresh from their ordeal in Algiers where they not only lost 2-0 to USMA, but also attracted as many as six yellow cards and three red cards which included Coach Hans Dieter Schmidt, the Porcupine Warriors will be expected to use this match to convince their teeming fans as to why the Algerians will fall in the return leg. At Sunyani, Bofoakwa and Ashantigold who exhibited their potential in the off-season will engage in yet another exciting Zone A battle, while RTU who are still not certain as to whether they are playing at the Tamale Kaladan Park or Bolga play host to in-form King Faisal. Berekum Arsenals who missed the last Top 4 by a hair's breadth will use Okwawu United as the foundation upon which to build this year's campaign for that high profile tournament. At El-Wak, new entrants, Real Sportive, might experience a fire baptism if the stuff exhibited by Great Olympics against Kotoko in a recent friendly is anything to bank one's hopes on. Coach David Duncan whose good work has been recognised by the FA following his appointment as the head coach of the Black Starlets will lead Hasaacas to battle against Power FC at the Sekondi Gyandu Park where they kept a clean record last season, while Coach Sam Arday's twinkle twinkle little stars, Fetteh Feyenoord, confound Heart of Lions with their brand of soccer at their adopted Cape Coast Siwdu Park.